Now the keyboard is standard size. Zero learning curve. 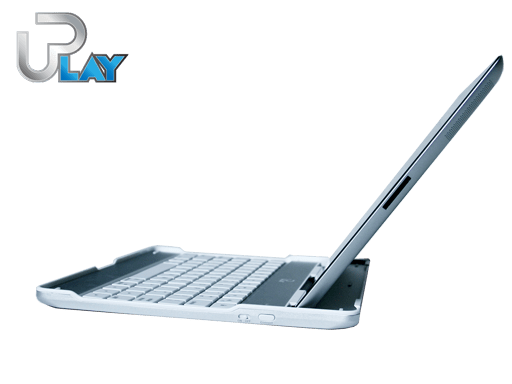 It’s a wireless keyboard , but it’s also a case to protect your iPad 2 and the new iPad (iPad 3 / iPad 2s ) when you close it. iPad keyboard case : It looks like a Mac Book Air, doesn’t it? No need to carry another charger: You can charge this keyboard with your iPad charger through this mini USB port. iPad keyboard case: The 2nd generation keyboard has improved iPad holding location and support. There are many counterfeits on the market. Make sure you see “uPlay” logo on the keyboard. Remove the iPad 2 and the new iPad (iPad 3 / iPad 2s) from the keyboard and your iPad automatically wakes up. Place it back on the keyboard and your iPad goes to sleep. 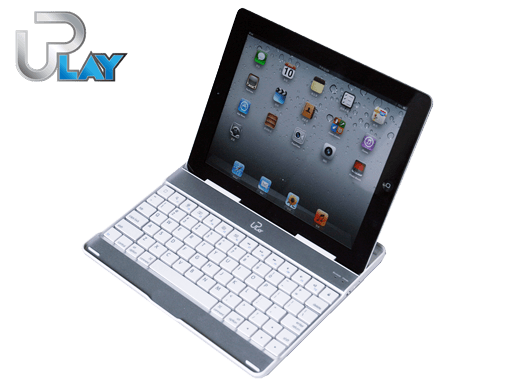 Includes uPlayTM Wireless Keyboard and Aluminum Case for iPad 2 and the new iPad (iPad 3 / iPad 2s), USB 2.0 A-Male to Micro-B Cable, and quick start guide. Looked extensively for a keyboard case that fit the style of the iPad 2 (clean lines, thin, no weird buckles, logos, etc.) and this fit the bill while being a lot less expensive than the Logitech case of similar design. Viewing angle works well for me, the keyboard is comfortable and it fits well with the iPad. While some of the other Bluetooth keyboard cases have part of the cover extending below the keyboard, which I don’t happen to like, this design allows me to pretty much create a netbook-looking configuration. Suits my need well, priced competitively against the Logitech keyboard cover and it arrived quickly. All good! Its a great , thin and useful case. i recently purchased it and i am very happy with its features, appearence and ofcourse the price i paid for it. Works great with the new iPad (iPad 30)! I bought one for my new iPad (iPad 3). It turns out it works great for the new iPad (iPad 3). I love it! Highly recommended to every iPad 3 owner - it's a 3-in-1 companion for your iPad - wireless keyboard, case, and stand. So cool (like Apple) and so affordable (not like Apple). First of all, this case is stylish and looks good with the iPad attached to it.It is really lightweight. which problems a lot when you\'re dealing with the sleek design of the iPad and want everything to look good. The special function key features are very useful, and everything from bluetooth to ability to charge with iPad plug is a big goal to buy this. Forget Logitech and other luxurious brands. The price is cheap too! My review about Wireless Keyboard and case for iPad 2 "
This product really WORKS! It's like bees being attracted to honey and that's probably a lot better off than you were before you started using the product.Recommended for everyone!!! Easy, lightweighted and stylish ! This is possibly the most innovative, easy and stylish way to use and carry around your iPad. The keyboard is so thin and light you won\'t even notice the extra weight. It\'s becomes easier to type and the exact same as an apple laptop. Speedier typing and a lot more tricks that you can use to make the most of your iPad. The battery life is amazingly long and charging only takes once a fortnight. I wouldn\'t go for any other case, the iPad keyboard is definetly a smart creation itself. this new laptop will have everybody buy it because how it looks and it has a ipod on it. also it has a wirless keybroad. and the name stands for it self uplay say it with me uplay. 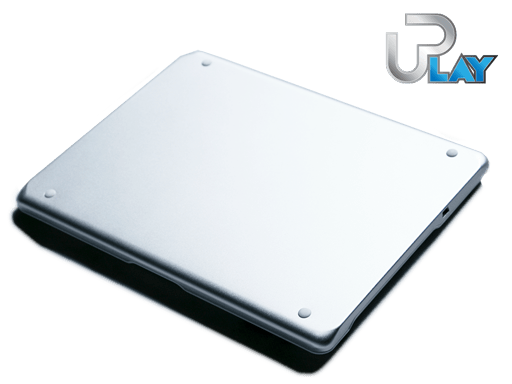 but the uplay looks like a laptop and a ipod and also looks like a mac book to.but when you fold the you play it doesnt look like a laptop. Just recently got this, and I gotta say its really useful. I hate typing on the touch screen, and this is a great fix. Not to mention very affordable and a great value for what it is. If youre a keyboard junkie like me, I highly recommend this product. Give it a go, you wont be sorry you did. Just got mine today, and I already love it. Ive been getting frustrated trying to type on a touch screen and this fixes all of my problems without adding any real bulk to defeat the purpose of having something as slim as an iPad. I recommend this product to all my fellow keyboard junkies. You wont be let down, give it a go if you havent already. 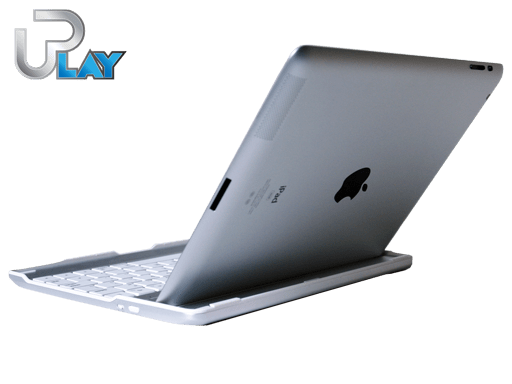 Best available keyboard case for iPads! 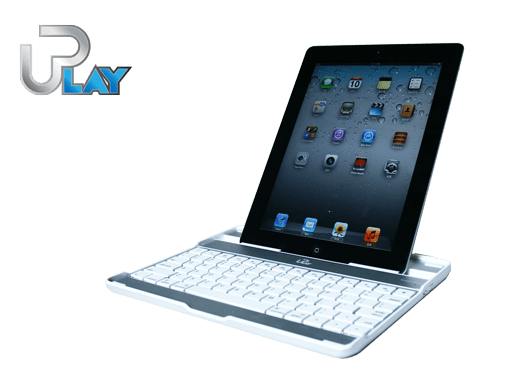 This keyboard is extremely lightweight and ridiculously stylish, which matters a lot when you\'re dealing with the sleek design of the iPad and want everything to look good. The special function key features are very useful, and everything from bluetooth to ability to charge with iPad plug is a big reason to buy this. Forget Logitech and other expensive brands, this one gets the job done for the right price and looks good doing it! First of all, this case is stylish and looks good with the iPad attached to it. It is extremely lightweight, and being able to place the iPad in portrait and landscape positions is a big plus. The special function keys are an awesome edition as well. I feel like I am on a netbook when I am using this, which is essentially the point. Competitor brands all have the same essential features but are priced much higher. 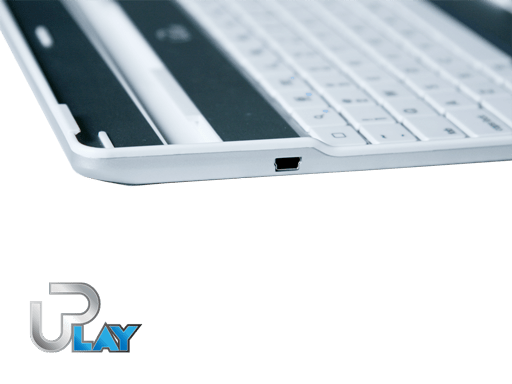 The UPlay wireless keyboard is a must have for iPad owners who use their device for more then reading e-books! iPad keyboard case - Totally awesome idea! uPlay makes life so much easier. I love how I can view my ipad from both landscape and portrait modes. I also love the convenience of not having to carry my charger around everywhere I go. I can charge through the USB mini port. So many features. The price is cheap too! 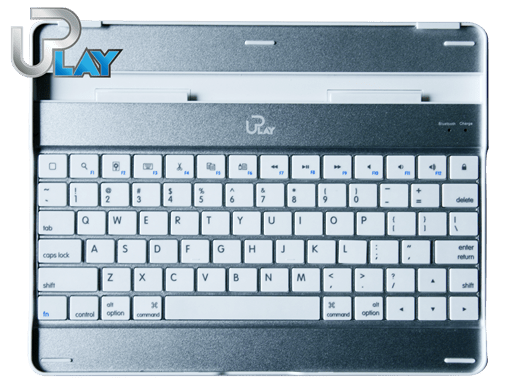 uPlay(TM) Wireless Keyboard is the best keyboard i have ever seen , it is wireless and very convinient for everybody it is very stylish also. i recommend to buy it because it is very good. 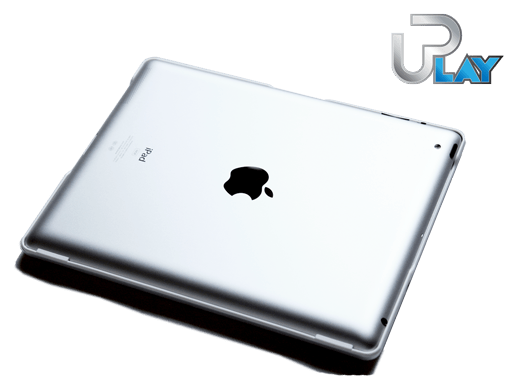 and the \"Aluminum Case for iPad 2\"
is also fantastic i also recommend this because it is very stylish and protect your i pad. I never write reviews but this product deserves a good one! It makes the I Pad look exactly like a laptop. Works every time! I actually prefer typing on it more than my desktop. Very durable. I'm really impressed for the price. I saved money buying this item because I didn't have to buy a separate case and keyboard. I recommend it to everyone I know. This keyboard is great! It\'s light enough and good price. They keys are small and it feels a little tight, but you get used to it pretty quickly. It\'s much better than typing on the virtual keyboard. The case is nice and protective, but not as practical to open and close as the standard magnetic cover. When on the stand, the ipad is at a perfect angle. It doesn\'t feel very sturdy though, and you need to be a little careful when using the touch screen. The build is also not that great, it feels a little cheap here and there, but you can\'t complain for the weight and price. *If you use Evernote, since the last couple of updates it is having trouble with the keyboard. It sometimes fails to break lines and the layout looks terrible. I ended up switching note editors and the problem is gone. In summary, this is a very elegant solution for typing on the ipad. I use my ipad at least 100% more often/longer than I used to, just because it is easy to type on it. If you like to take notes and type, this is a great product and I highly recommend it. This product is everything expectd. The battery outlasts the ipad. It just works!!! Now I only carry my laptop when I am leaving for a trip. Running around my ipad is all I need.